The Aeroflot Group is the leading airline group in the Russian Federation by some distance. Its airlines have strong market positions at its hubs across the country, which extends from Europe to within a short distance of China, Korea and Japan. The group has been profitable for over twenty years and its passenger traffic is growing at double digit rates. Its market position has benefited from a government “national champion” policy, through the 2011 acquisition of a number of state-owned regional carriers. Nevertheless, its 2012 profits were diluted by losses in the newly acquired subsidiaries. In an attempt to address this, its two carriers in Russia’s Far East are to be merged. Moreover, the major European country with the lowest LCC penetration looks as if it may soon have its very own no-frills airline after Aeroflot’s recent announcement that it plans to establish a new LCC subsidiary. The Aeroflot Group of airlines consists of Aeroflot, Donavia (based in Rostov), Rossiya (St Petersburg), Orenair (Orenburg) and two carriers based in the Russian Far East, Vladivostok Air and SAT Airlines. The latter four subsidiaries were acquired in Nov-2011, while Donavia has been a 100% subsidiary since 2007. 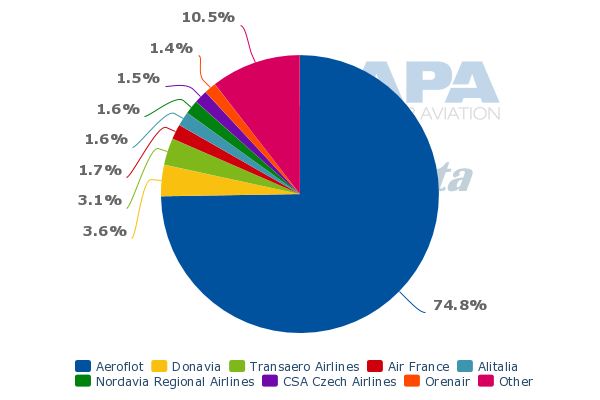 The Aeroflot Group is the leading player in the Russian Federation overall by number of seats, with a share of 34% of seats (week of 29-Jul-2013, source: Innovata). 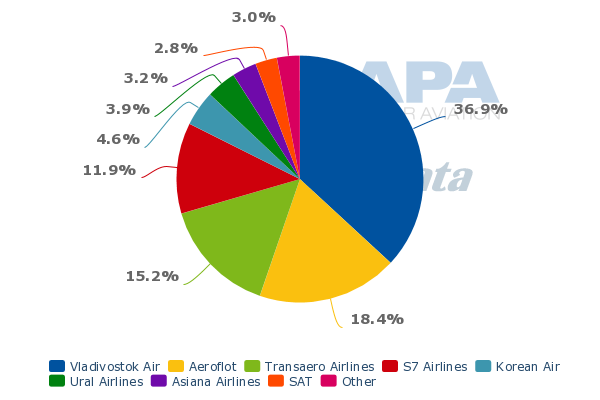 Its nearest competitors have much lower market shares: S7 and Transaero each have 10% share and UTAir Group has 8%, but these three appear on many of Aeroflot Group’s biggest routes. The Aeroflot Group is also the leader on international markets between Russia and every global region, apart from the two smallest regions Africa and Latin America (Transaero is the leader in both regions). The group carried 27.5 million passengers in 2012, giving it a share of 37% of passengers in Russia. Aeroflot itself carried 17.7 million (growth of 24.6%) and its subsidiaries 9.8 million. The four that were acquired in Nov-2011 carried 9 million passengers between them in 2012. Group passenger load factor gained 1.3 ppts to 78.1%. The group’s growth rate in 2012, adjusted for the acquisitions (i.e. on a like for like basis as if the acquired companies had been part of the group throughout 2011), was 21.6%. Transfer passengers in the Aeroflot parent grew by 35.7% to reach almost one third (32.6%) of passengers. Strong growth has continued into this year. In the first six months of 2013, Aeroflot (excluding the subsidiaries) saw passenger numbers grow by 20.2% to 9.5 million, with load factor up by 2.3 ppts to 77.1%. 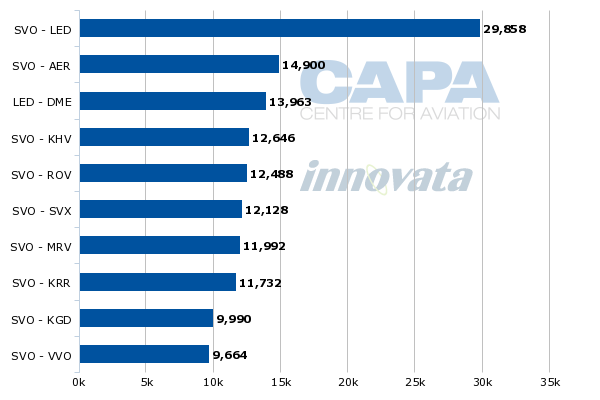 The group has more than half (53%) of its seat capacity on international routes (source: Innovata, week of 29-Jul-2013). Almost three quarters of its international seats are to Europe, more or less evenly split between Eastern/Central Europe and Western Europe. Its next most important international regions are Asia and North America. 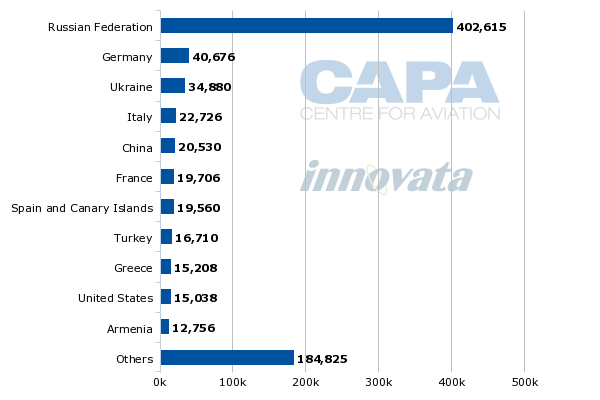 Its most important country by seat capacity outside Russia is Germany, followed by the Ukraine and Italy. China is its biggest Asian market and France, home to SkyTeam partner Air France, is its fifth biggest international country market. The group’s biggest hub is Moscow Sheremetyevo, home to the parent Aeroflot airline, where it has more than three times the seat capacity that it has at Rossiya’s hub St Petersburg. With less than one fifth of the group’s St Petersburg capacity, its next two hubs are the Far Eastern airports of Khabarovsk and Vladivostok, which are Vladivostok Air’s two biggest bases. 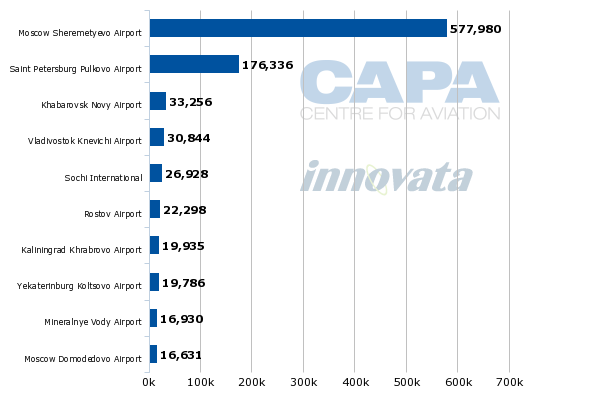 Aeroflot has a 75% share of seats at its Moscow Sheremetyevo hub (source: Innovata, week of 29-Jul-2013), a stronger position than almost any major European national carrier. Group company Rossiya is the leader at St Petersburg, with 43%, and Aeroflot itself has 9%, bringing the group’s share to 52%. Vladivostok Air, Aeroflot and SAT have a combined share of 56% of seats at Khabarovsk Novy Airport and, at Vladivostok, they combine to achieve 58%. These are all strong market positions. The group also has a strong market share at most of its other top 10 hubs. It is number one at eight of the 10 airports and number two at one. At Sochi, Aeroflot is the number one carrier with 18% (41% for the group overall); at Rostov, Aeroflot subsidiary Donavia is number one with 40% and Rossiya has a further 2%; at Kaliningrad, Aeroflot is number one with 27% and Rossiya number two with 26% (53% for the group); at Mineralnye, Donavia is number one with 37% and the presence of Rossiya and Aeroflot bring the group’s share to 50%. 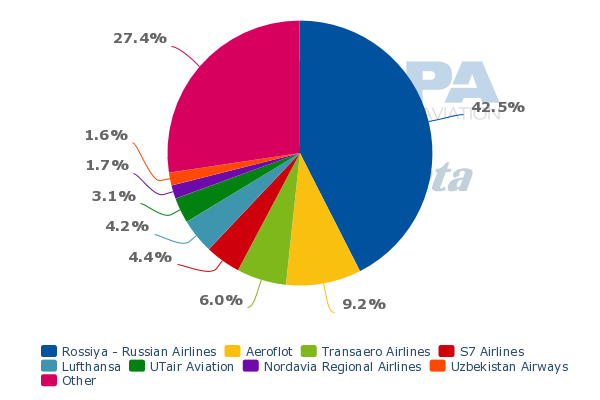 At Yekaterinburg, Aeroflot’s 12% share puts it number two to Ural Airlines’ 37%, but Donavia’s 4% and Rossiya’s 3% gives the group 19% in total. Only at Moscow Domodedovo, where Rossiya is seventh with 2%, does the group find itself outside the top two. At Orenair’s hub in Orenburg, the group has 96% of seats (including 13% for the Aeroflot parent). SAT has 36% of seats at its Yuzhno-Sakhalinsk hub in the Far East and the group has 34%. The Aeroflot Group’s top 10 domestic routes all feature Moscow, nine of them from Sheremetyevo airport reflecting the importance of the parent carrier’s main hub. Only two of the routes, Khabarovsk and Vladivostok are to destinations in Russia’s Far East. The Aeroflot group’s competitive position on its top 10 domestic routes is strong in that it has the number one carrier on all 10 routes. On five of the 10, it has more than one of its group airlines. However, it faces competition on all of 10 of the routes, with three or more competitors on eight routes and four or more on seven. All of the group’s top 10 international routes by seats feature the Sheremetyevo hub. Seven of them are to Central/Eastern European destinations, of which three are in CIS countries. Two are to Western Europe (the SkyTeam hub at Paris CDG and London Heathrow) and one (New York) is to the US. The Aeroflot Group ranks in the top two by seats on all 10 of these routes, with five number one and five number two positions. Although it has fewer number one positions than it does on its top 10 domestic routes, the competition situation is slightly less robust. On three of the routes, there is only one competitor to the group’s airlines and there are three or more competitors on only five routes. 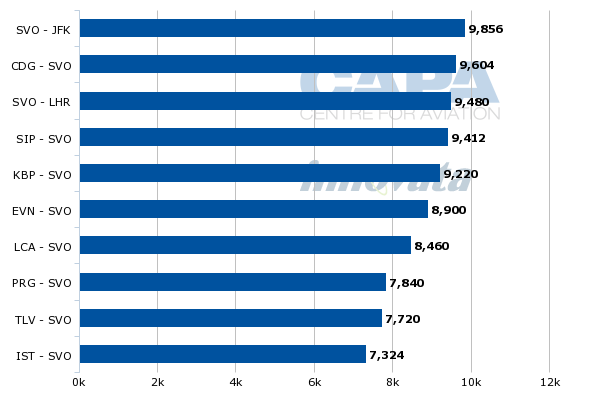 The list of Aeroflot group’s top eight intercontinental routes, ranked by ASKs, highlights the much less competitive nature of long-haul. It has the number one carrier by capacity on all eight of these routes, which include one monopoly (Moscow to Shanghai, which China Eastern ceased operating in Jul-2013, according to Innovata). There are no more than three competitors on any of these routes (on seven of them, there are no more than two competitors). 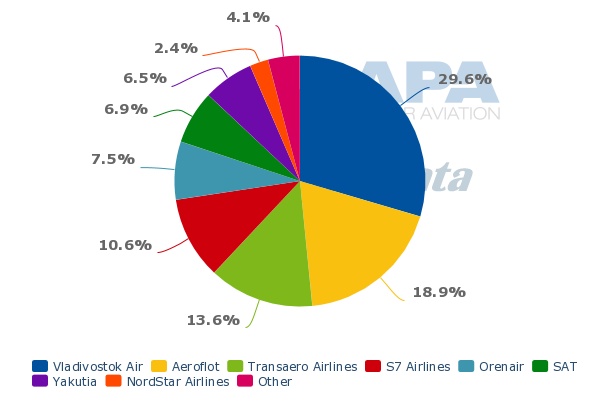 In summary, the Aeroflot Group has a stronger position than most major European national carriers. 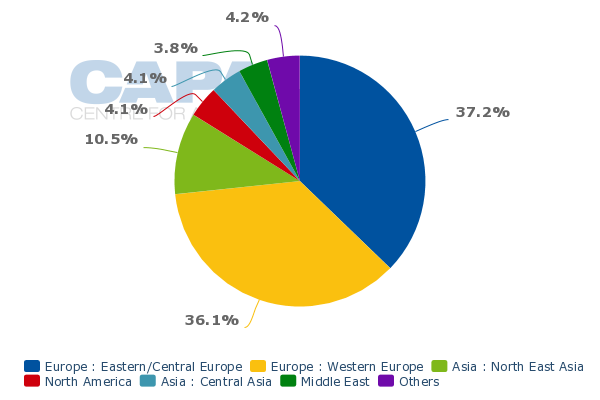 Growing rapidly, it has a leading share of seats in its home country and group carriers dominate their principal hubs. The acquisition of four subsidiaries in 2011 helped to create this strong position and the merger of Vladivostok Air and SAT should further consolidate its strength in the Far East of Russia. A further positive factor that has helped Aeroflot is that Russia has yet to see the low-cost carrier revolution. 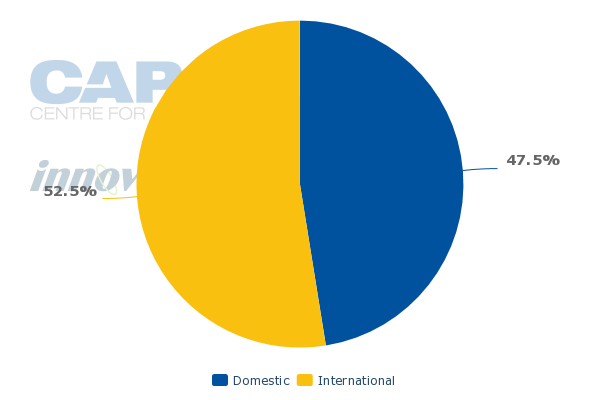 Fewer than 6% of domestic seats and only around 3% of international seats are operated by LCCs, although no market has escaped the price consciousness that LCCs have brought to consumer attitudes. On 26-Jul-2013, Aeroflot said that the parent airline’s financial performance was better than planned in the first three months of 2013, but that passenger numbers and revenues for the group were 3% lower than planned due to “the impact of operating indicators of some subsidiaries”. The airline announced that it is planning the establishment of a 100% owned LCC subsidiary, with a “base product” that would be “maximally different from Aeroflot”, to start as early as 2014. The LCC would have prices at a 20% to 40% discount to traditional carriers and could even compete on price with rail travel, according to Aeroflot. Its initial focus would be the European part of Russia, before expanding across the Russian regions and abroad. Perhaps Aeroflot is looking anxiously at the arrival of major European LCC easyJet at Moscow Domodedovo. Moreover, the hinted-at on-going weak performance of the group’s less strongly branded subsidiaries perhaps indicates a growing commoditisation of air travel away from Aeroflot’s Sheremetyevo hub. The group has been profitable for many years, with no annual losses for at least 22 years (although the subsidiaries acquired in 2011 weighed on its 2012 profits). Over this period, other major European national carriers have all made losses more than once and have seen a large chunk of their short/medium-haul business taken away by LCCs. Russian domestic prices are high to very high and Russia's bilateral policy is not generous, helping protect its favoured carrier. Domestic LCC entrance by Indigo Partners-backed Avionova has illustrated that there is plenty of room for demand stimulation – perhaps part of the reason the private airline was ushered out of the market. So there can be little doubt that the Russian market is ready for some real LCC presence. Aeroflot is right to act before it gets too late, although the successful fruition of its plans for a LCC subsidiary will be all about execution.